The following sermon was preached by President Dr Thomas Winger at the CLTS Opening Service on Sunday, 8 September 2013, in the Martin Luther Chapel. The text included the LCC seminaries’ theme for the coming year. Dear living stones in the Temple of our Lord: As you enter the seminary by its main door, you pass by the building’s “cornerstone”. Well, it’s not really a cornerstone in any proper sense. It sits in the middle of a wall. It serves no architectural function I can think of. It looks like we could slice through the mortar on four sides and slide it out without the building collapsing around it—which, of course, is what it’s designed for. It’s meant to come out some day, I suppose on the building’s 100th anniversary. There are probably some important pieces of memorabilia inside, though Dean Humann can’t remember what they are. That’s probably just as well. It looks disconcertingly like marble plaque covering a niche in a mausoleum, and I wouldn’t be too surprised if we found someone’s ashes inside. But opening it isn’t really the point. It’s real function is to remind us. It reads “1983”, a reminder that we ought to be celebrating the thirtieth anniversary of the construction of this marvellous facility. The building is approaching early middle age and has needed some work—we’ve replaced six massive HVAC units, and we need to act quickly to re-lay the leaky roof—but all in all this building has been something we can rely on. It’s a gift of our forefathers (some of whom are still here), an inheritance that’s precious and secure. Together with a hundred-year lease on our property from Brock, it means we have something to count on. We’ve had some troubled times at this seminary—quite a lot, lately, but as our resident historian tells us, there never was a golden age. There have been human casualties, lost faculty and staff. We’ve had our share of difficult, even incompetent students, some of whom we were foolish enough to let loose on the church. We’ve made mistakes, for which we’re duly penitent. We’ve also suffered, like any Christian, simply because we live in a fallen world. Our endowment fund has been shaken by a major stock market crash. Our synodical subsidy has been cut as our church body shrinks in numbers and budgets get tighter. We have less money from tuition fees because we have fewer students. And fewer and fewer students means that we might not be able to do our job of providing pastors to the churches that need them. All in all, it can be pretty depressing. But at least we have a nice building. Well, that’s a pretty pathetic response. What are our blessings? They are great in many ways, as St Paul might have said. We have enough money to do what we need to do. We have faithful teachers of great scholarly ability and pastoral experience. We have a fine crop of students devoted to studying the Word of God. We have supporters across the country sending us gifts, adopting our students, writing us into their wills, and praying for us. And we have all of you, who sacrifice your afternoon to join in rejoicing over a new year of pastoral preparation and theological study at this seminary. Who could ask for more than that? But can any of these rich blessings serve as a firm foundation? As we head into board meetings and synodical conventions, we’re so tempted to point to these our accomplishments—we’ve balanced the budget, we’ve paid down our debt, we’ve sorted out the technology. But when Paul wrote to the Ephesians, he had very different things to say about what “they” and “we” had done. “And you [pagan Gentiles]—when you were dead in your trespasses and sins, in which you once walked according to the age of this world, according to the ruler of the authority of the air, the spirit of the one now working in the sons of disobedience” (Eph. 2:1-2)—not very kind things does he have to say, and why would he, when they both well knew that they had spent their lives worshipping demons. Absolutely nothing to be proud of. And before the Jewish Christians could protest that they weren’t quite so bad Paul adds, “among whom also we all once conducted ourselves in the passions of our flesh, doing the desires of the flesh and the thoughts, and we were by nature children of wrath like the rest” (Eph. 2:3). They had absolutely nothing that they could hold up before the Lord, whether Gentile or Jew. Everything they had to offer was like the proverbial sinking sand. In fact, it was worse. It wasn’t just that they had an uncertain foundation for their lives before Paul brought them the Gospel of Christ. They built their lives on an act of rebellion. 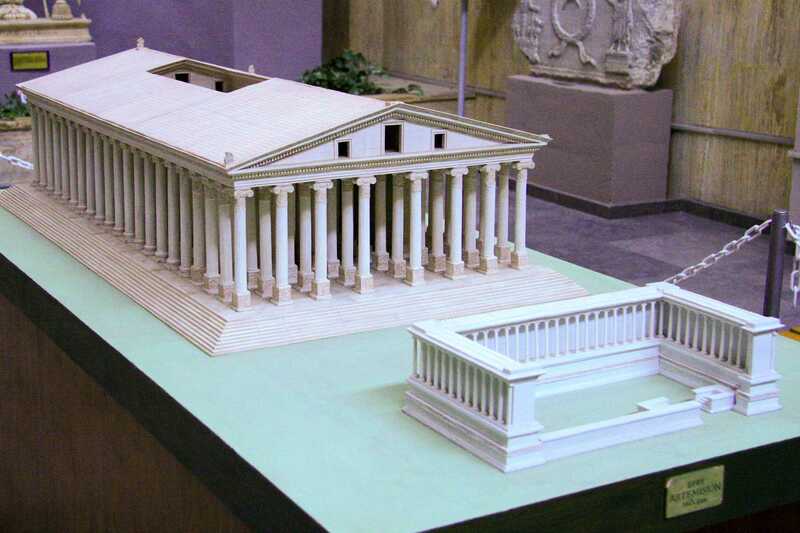 It’s a fascinating irony that two of the greatest architectural treasures of the ancient world were the Temple of Artemis in Ephesus and the Herod’s Temple in Jerusalem. The Temple of Artemis was massive, 130 metres long and 70 wide—bigger than a football field, as we’re accustomed to saying today. It had 127 marble columns, each nearly 20 m etres high. In the middle of the temple was a gargantuan statue of Artemis, the most powerful god of western Asia. Pilgrims flocked to Ephesus seeking her power and favour. Magicians did wonders in her name. Silversmiths made a fortune from selling her image. But her temple was no more solid than a house of cards. Her religion came crashing down when confronted with the power of Jesus’ name. The temple itself survived another two hundred years before it sank into a swamp, neglected and looted. But it was doomed from the moment Paul proclaimed the Name that is above every name that is named, the Christ whom God had lifted above every “ruler and authority and power and lordship” (Eph. 1:21), subordinating them all under His feet. Paul gave the Ephesians a new foundation, a solid base for their new life in Christ. It would be easy to repeat the story for the Jewish people. 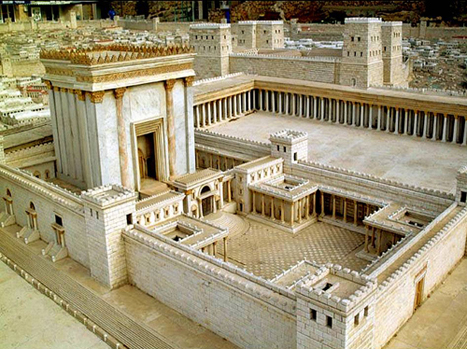 From Solomon to Herod the Jerusalem Temple grew in size and magnificence—only to be imagined today from the vast expanse of the temple mount. It was the pride of the people. And though it held the promises of God, that He would be present there with His grace and blessing, prepared always to hear their prayers, those same precious stones became a false hope for Israel. They simply couldn’t believe that God would allow any enemy to come in and destroy that precious building—whether they remained faithful to Him, or not. But when they worshipped false gods, when they did deals with Egypt to protect them from divine punishment through the Assyrians, God showed them how badly they’d miscalculated. They’d bet the farm on the wrong horse. And without trust in God, those stones were cold, lifeless, and helpless. The Temple itself couldn’t save them. It was no firm foundation. 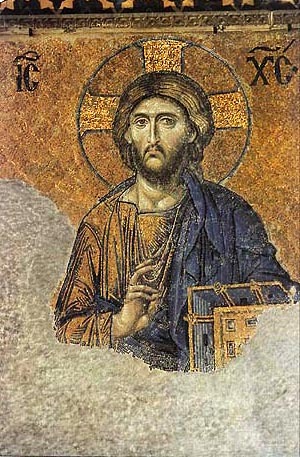 Paul in our text alludes to a prophecy from Isaiah 28 that’s quoted in the NT more than almost any other, where God says to rebellious Israel, “Behold, I am the one who has laid as a foundation in Zion, a stone, a tested stone, a precious cornerstone, of a sure foundation: ‘Whoever believes will not be [put to shame; LXX]” (Is. 28:16). God said that to warn the Israelites against putting their hope in the Egyptians instead of trusting in the promises He gave them, that were symbolised by the Temple and its worship. But like anything else that sinful people get hold of, the Israelites twisted those words into a guarantee attached to the stones of the Temple. They trusted in the building rather than the Builder, the God who dwelt in it. And when that God showed up in the flesh, when, as Malachi prophesied, God suddenly appeared in His Temple, the people Israel were faced with a terrible choice: the Temple or Jesus, dead stones or the living Rock, and for the most part they made the wrong choice. Do you remember the words of the chief priests? “If we let Him go on this way, everyone will believe in Him, and the Romans will come and destroy both our [holy] place and our nation” (Jn 11:48). Faced with a life and death decision, they laid hands on the living Lord and put Him to death. They picked up their chips and bet on the Temple. But the Lord God raised up the living cornerstone, and the dead rock of the Temple He laid waste through those feared Romans who left not one stone standing upon another.